Columbia, Mo. (Dec. 5, 2018) — As Nobel laureate George Smith prepares to receive the prestigious Nobel Prize in Chemistry for work he did at the University of Missouri, two Missouri Journalism seniors will have their own once-in-a-lifetime opportunity reporting on his journey in Stockholm. 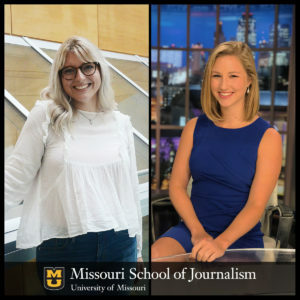 Meg Cunningham and Savannah Rudicel will provide wire-service-type coverage of the Nobel Prize ceremonies and related events for the School’s newsrooms – Columbia Missourian, KOMU-TV and KBIA-FM – during their visit Dec. 5-12. As the team made plans for coverage, they asked news directors at the various newsrooms for a coverage “wish list,” said Nathan Lawrence, KBIA digital content director, who is accompanying the students as their editor. University of Missouri undergraduate students Meg Cunningham and Savannah Rudicel will travel to Stockholm to help provide coverage as Nobel laureate George Smith prepares to receive the Nobel Prize in Chemistry. The team will shoot photos for a Columbia Missourian photo gallery and Rudicel will do live shots from Stockholm for KOMU-TV. Their coverage will include press conferences, lectures and Dr. Smith’s interaction with the two Nobel laureates who share the award with him. Smith is a curators’ distinguished professor emeritus of biological sciences. Although the team wasn’t able to obtain tickets to the awards ceremony and banquet, they hope to get some audio clips. Lawrence and KBIA News Director Ryan Famuliner are spearheading the reporting trip. They asked professors from across the school to recommend “the best and the brightest” students known for their good work ethic and high quality work. These students’ “names kept floating to the top,” Lawrence said. Both women said they are thankful for their experiences in school and during internships that have prepared them for this new hands-on learning experience. In addition to working at KOMU-TV as a reporter and anchor, Rudicel, of Lenexa, Kansas, studied abroad in London last spring where she worked as a reporter intern for the London Live TV channel. Cunningham has worked with KBIA-FM, Vox Magazine and the Columbia Missourian, and is wrapping up a Reynolds Journalism Institute Student Innovation Fellowship at ABC News this semester where she’s been reporting on the congressional midterm elections. Preparing to cover Dr. Smith required Cunningham to pull out old high school science textbooks to better understand his work, she said. She also had the opportunity to chat with the Nobel laureate when he was visiting Washington, D.C., with MU Chancellor Alexander Cartwright for a Nobel Prize celebration earlier this fall. The trip will also provide learning opportunities for the newsrooms involved as they collaborate. One challenge the team is tackling will be sending a live feed from Stockholm to Columbia for a live broadcast, but KOMU has been working to address this. The students will be gone for a week, which includes portions of finals week. They are producing coverage before the event and will be busy as soon as they return. When Cunningham returns to Missouri from Stockholm on Dec. 12, she will finish preparations for her final senior capstone project presentation which she gives on Dec. 13, she said. Famuliner said that although the newsrooms have worked together on projects in the past, they hope to continue to grow to collaborate more effectively and efficiently. He is currently pursuing a Hearst Fellowship to explore the Missouri School of Journalism media outlets pooling their resources to collaborate. “This is going to be a good demonstration of how we can have a pop-up newsroom cover a major event and make it work for all the newsrooms at our varying deadlines and needs,” added Famuliner. There will be a ceremony watch party for the MU campus community on Dec. 10 at 9:30 a.m. Central Time. The event will also be livestreamed.